From one angle, it’s a surprise to see the classic RPG do so well out of early access. How can a genre which thrives on density and choice find success in letting players potter about the map before it’s fully drawn? 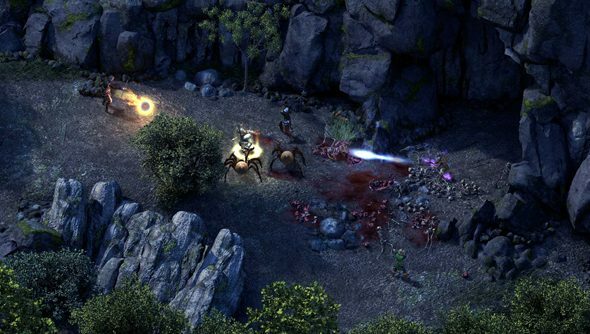 InXile made it work by fencing off regions in Wasteland 2’s beta, and Obidian have taken a similar tack for Pillars of Eternity. Their new beta, open to select backers, consists of the village of Dyrford and its busy environs – and is entirely spoiler-free. The beta is open to backers who pledged $110, or who bought the related add-on package. Dyrford is surrounded by wilderness and, beneath that, dungeons. Players will be able to assemble a character from all the races, classes and cultures available in the finished game. “You build a character at 1st level, but you will start the game with enough experience to advance to 5th,” wrote Obsidian’s Josh Sawyer. “While we have very few Talents in the Backer Beta, you should be able to get a very good idea of the core functionality of all eleven classes. Beta players will begin with four intentionally generic party members – none of whom will be companion characters. That’s part of Obsidian’s drive to avoid spoilers. Did any of you lot pledge enough to bag yourself some worry-free wilderness-wandering this week?